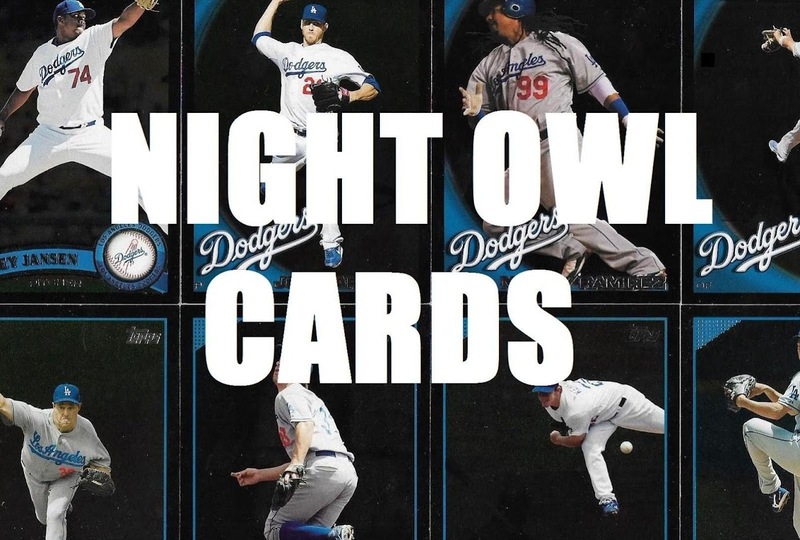 I tried to find a night card that fits a Halloween theme, but this was the best I could do. 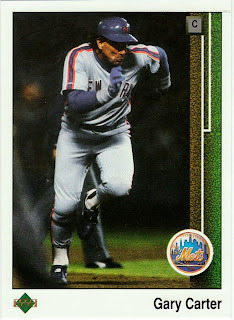 Doesn't Gary Carter look like he is in a panic, running from what appears to be a shadowy, headless, umpire figure? Humor me, it's Halloween. 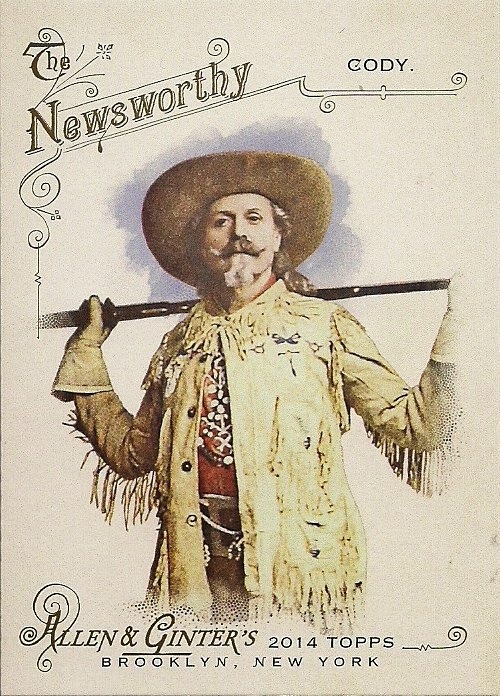 This card was among a group of the first night cards that I have received in a blog trade. I got them from gcrl of the garveyceyrusselllopes blog. Both gcrl and I are Dodgers fans, but it looks like he's accumulated many more Dodgers than I have. 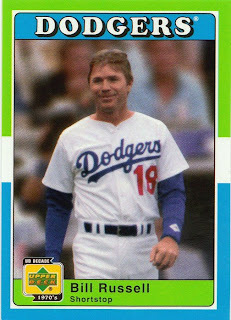 Yikes, the box I received in the mail on Monday contained just short of 200 cards, nearly all of them Dodgers! I've yet to send him his cards, partly because I'm in the midst of wading through all these gems. 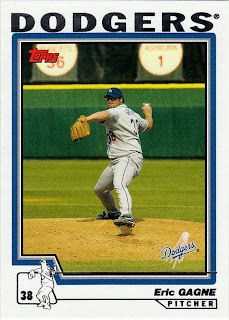 Eric Gagne, 2004 Topps. 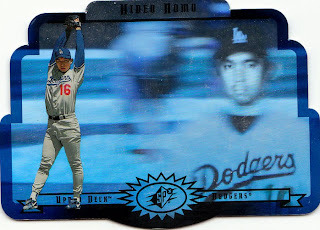 I don't know what Topps was going for in 2004 and 2005 with their photos. Gagne is a big guy but he looks like you could pick him up with two fingers. Did they take this photo from the the second deck? 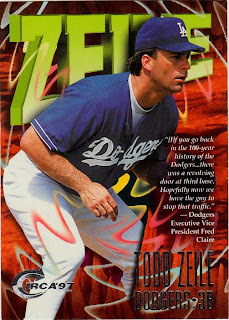 Did Topps decide that because Upper Deck's mantra was "we'll continue to keep you as close to the game as you can get" that they would go in the opposite direction and take you as far as you could get? 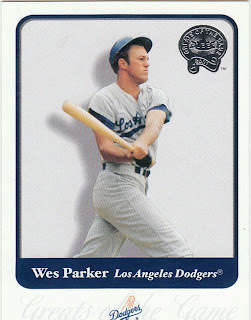 Wes Parker, 2001 Fleer Greats of the Game. It's in the bylaws of the Los Angeles Dodgers constitution that they must have a matinee idol on every team. Parker was the guy during the late 1960s-early 1970s. He appeared on several TV shows, including the Brady Bunch, playing the boyfriend of the math teacher Greg had a crush on. I'm guessing that L.A.'s current matinee idols are Andre Ethier and Blake DeWitt. But I'm not a regular reader of Tiger Beat (is that still around? ), so I could be wrong. 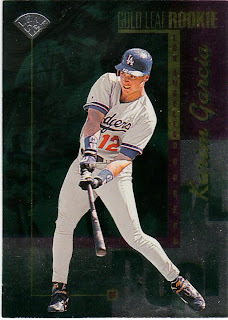 Karim Garcia, 1996 Leaf Rookie. I'm not sure what's more disturbing: 1) that I received 7 different Karim Garcia cards in this box, 2) that gcrl likely has many more Garcia cards, or 3) that card manufacturers actually produced this many cards of Garcia during a two-year span. I'm going with option No. 3. The answer provided to this question is Willie Mays, and in parantheses it says "1953" and "1974" Well, for one, Mays was retired in 1974. UD meant "1973" when Mays played for the Mets against the A's. And secondly, Mays didn't play in the World Series in 1953. Again, UD meant "1951". Finally, 1951-1973 would be 22 years apart, not 19. Good thing UD's not writing trivia for "Jeopardy," eh? There'd be lawsuits all over the place. How about that? gcrl sent me four Cey cards I don't have. That alone is worth the price of admission. 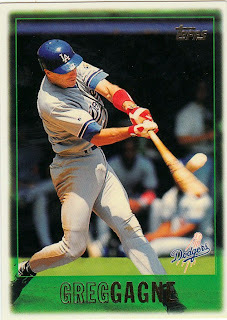 The last card in that series is an Upper Deck Sweet Spots Classic card. These cards have the odd habit of featuring a player with one team on the front, praising the player for his accomplishments for that same team on the back, then featuring stats for ONLY the other teams he played for (in Cey's case the Cubs and A's). Huh? 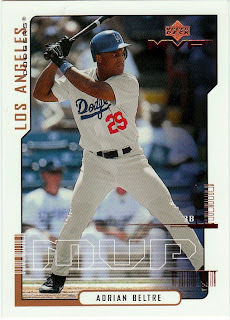 Adrian Beltre, 2000 Upper Deck MVP. Get ready: I received -- no lie -- 17 different Beltre cards in this box. Amazing! 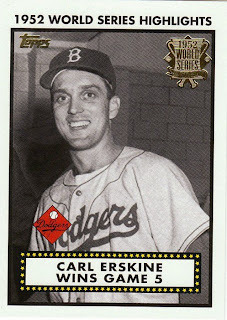 Carl Erskine, 2001 Topps World Series Highlights. Erskine is one of the original good guys. 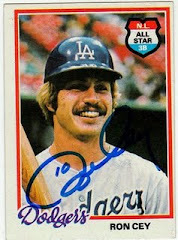 I enjoyed his book, "Tales from the Dodger Dugout," written a few years ago. It was an informative, behind-the-scenes book, but it didn't get seedy. I'm all for "Ball Four," but sometimes a different perspective is nice. 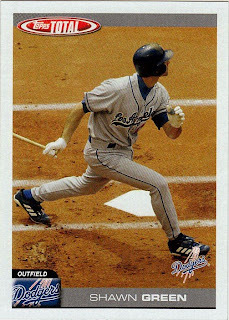 Robin Ventura, 2004 Topps. This was during a period not so long ago when the Dodgers were randomly acquiring players, throwing them on the wall and seeing if they stuck. Ventura didn't stick. 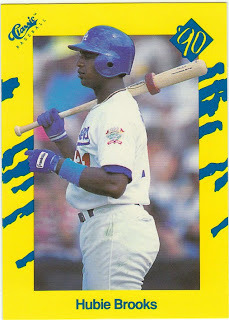 Neither did this guy, Fred McGriff. But how cool is that? 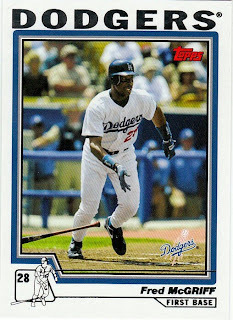 McGriff in a Dodger uniform! And today's his birthday! 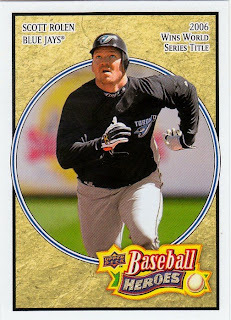 John Shelby, 2004 Upper Deck Legends Timeless Teams. 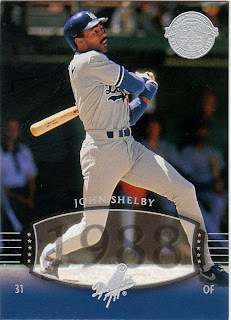 Shelby isn't any legend, although he did help L.A. to a World Series championship (to this day, I don't know how it happened). 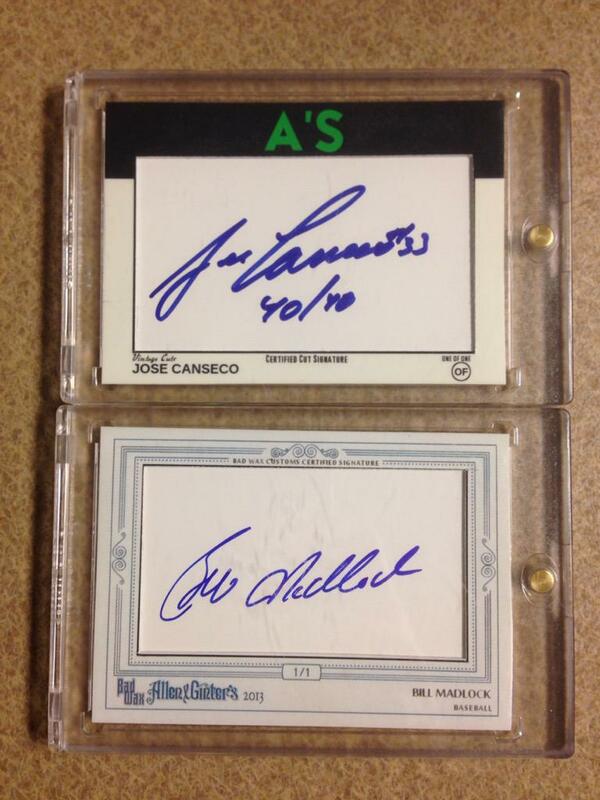 These cards remind me a bit of the Topps Fan Favorites cards. 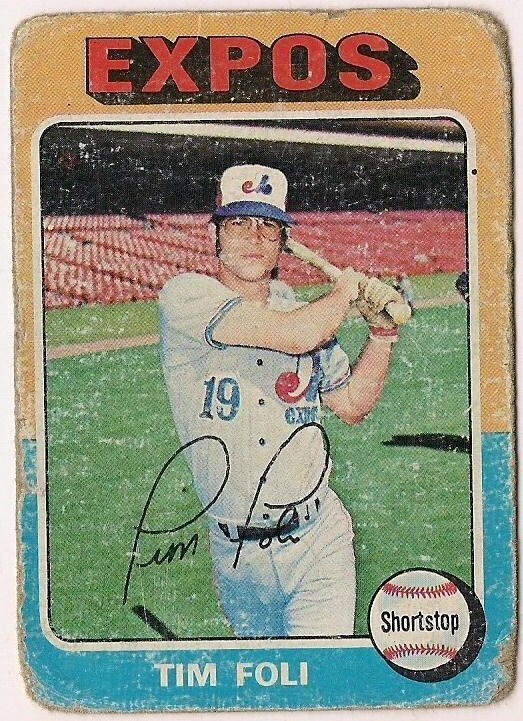 Fan Favorites had its own problems, issuing cards of certain players who were far from the favorite of this fan. Tom Niedenfuer? A Fan Favorite? Certainly not after he gave up that HR to Jack Clark in the 1985 NLCS. 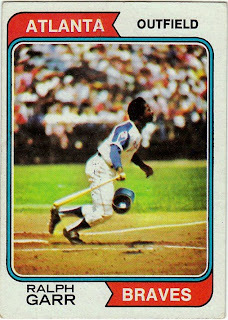 He was my favorite to have catapulted out of the stadium with a rocket launcher, if THAT is what Topps meant. 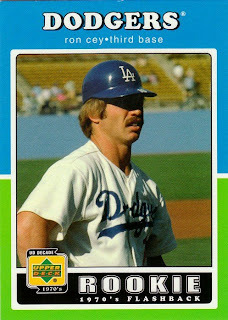 (Someday I'll write on here how I absolutely knew even before Lasorda put Niedenfuer in the game that he would give up a devastating HR to Clark. Lord knows plenty of people have heard me talk about this, I might as well share it with the other 156 in the world that haven't). Ahhh! Here's my Halloween card! Didn't that make you jump? These '94 Collector's Choice checklist cards are so freaky. 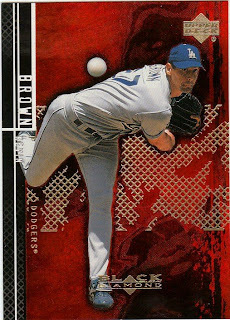 Shawn Green, 2004 Topps Total. 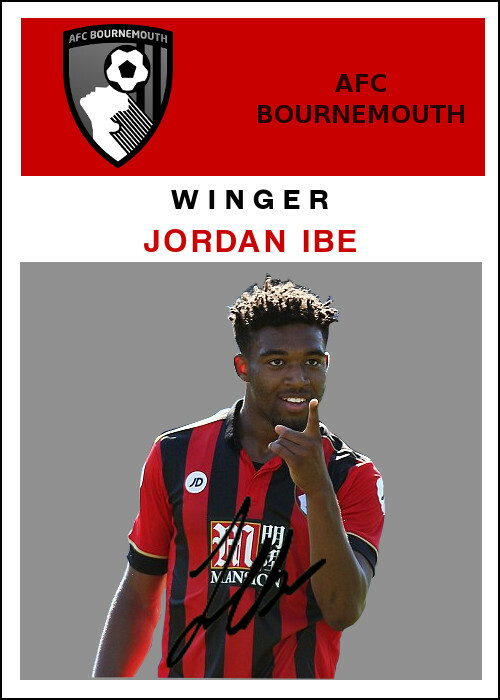 Nice card. I think Green could get to first base in just four strides if he wanted to. 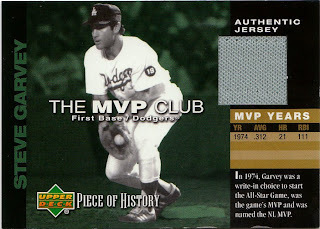 Finally, a jersey card of Steve Garvey. Sweet! Certainly unexpected! Looks like the road uni. Cards are coming, gcrl! Meanwhile, read his blog, especially if you're a Dodger fan. And arrange a trade with him. You won't regret it. Meanwhile, this is probably the last post for the day. I'm off trick-or-treating with my daughter. She's going to be a pirate. And, you, according to my recent poll, are dressing either as Evan or Eva Longoria. Happy Halloween, all. 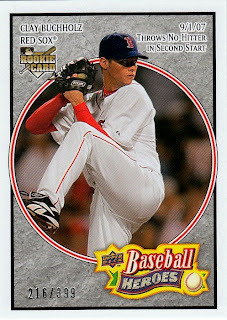 I brought home my first packs of 2008 Upper Deck Baseball Heroes yesterday, even though I'm pretty sure that somewhere, either on this blog, or in a comment elsewhere, or in a rant at work, or talking in my sleep (I actually don't do that), I mentioned that I'm thoroughly unimpressed with this product. So I can't explain why I bought these. I guess I just wanted something different. In opening the packs, I struck upon the reason why the Heroes cards work. It's a reason that I'm sure has been addressed many other times elsewhere, but I confess I often go into shutdown mode when certain card subjects come up (sheepish grin), so I might have missed it. ... is the most god awful boring piece of cardboard I've seen on a current set (OK, there are a couple others -- UD SP Authentic isn't keeping me awake either). Using the background of what appears to be a crinkled brown bag? Wha? 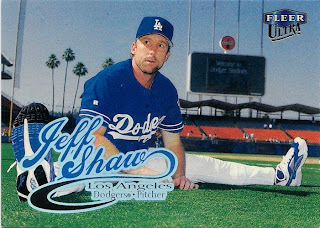 I know some people have great affection for these cards because they remind them of the old UD Baseball Heroes of the '90s. But I didn't like those cards either. 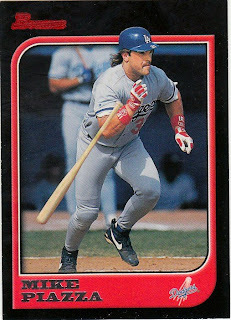 Early '90s cards? Not a lot of affection there. ... Silver is nice. And it's numbered to 399. (During Buchholz's breakout season last year, in one of his first starts, the Associated Press write-up spelled his name three different ways and interchanged those spellings throughout the story. It cracked us up so much at work that the article still hangs on a bulletin board in our department). Gold is nicer. And it's numbered to 299. 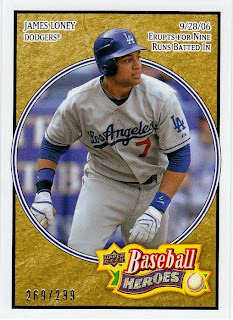 And it's James Loney, who I think opened a few eyes among casual fans this postseason. ... your eyes are bugging and your mouth is open. Electric green! Stan the Man! Numbered to 499! Cool! 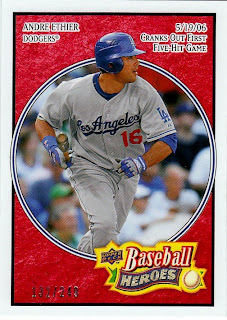 And then I pulled a red parallel of Andre Ethier (numbered to 299), and I suddenly didn't feel that these cards were a waste of my money. Suddenly I was one of those kids who was throwing all the base cards into the garbage and saving the inserts. And then I realized that I didn't WANT to be one of THOSE kids. Somehow in the span of a few packs, I had gone from feeling disappointed to excited to cheap and dirty. That's what Baseball Heroes does to you. 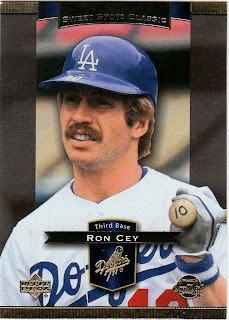 It bores you with the base card so much that you can't help but be impressed by anything else in comparison, and then it makes you hate yourself. I don't think I'll be buying any more. Wow, I didn't know giving away free cards would be so difficult! How is it that no one guessed that caramel creams were my favorite kind of Halloween candy when I was a kid? Am I that much of a freak? (don't answer that). Perhaps my hint that it is a kind of candy you often find in movie theaters threw people off. But I know I've seen Goetze's caramel creams in theaters. I just saw them a few months ago. And, geez, the candy maker's been around since 1895! 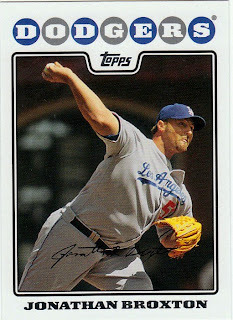 Yup, it was the big boy, Jonathan Broxton. So, in the event that no one guessed either part of the question, I said the winner would be whoever (whomever?) came closest on the first part, guessing the right kind of candy. That involved a lengthy whittling down process. Sour Patch Kids and Gummy Bears (I first remember seeing Gummy Bears when I was in college and hot for this girl I worked with in a department store. She loved Gummy Bears and I got myself good and aquainted with the GB). Secondly, I disqualified candies that first made an appearance when I had just about put the whole trick-or-treating thing to bed. Those would be Starbursts and Skittles. And I eliminated candies that may have been around when I was young, but I just wasn't aware of them: Hot Tamales and Swedish Fish. OK, next I eliminated the candies that I didn't like or just wasn't all that crazy about. Those would be Good n' Plenty (yuck, black liquorice), Dots (they get stuck in your teeth) and jujubees (same thing). I also eliminated the candy that was OK, but not my favorite (Mike-n-Ike, dum dums, Twizzlers and Sweetarts). So, that leaves four kinds of candy left: Bottle Caps, Nerds, Payday and Rockets. Rockets are the Canadian version of Smarties. They were good, but not great, so I eliminated those. Nerds I enjoyed quite a bit, but my mother hated them because they made a mess, so we didn't get to have them much. So Nerds are out, too. I loved Bottle Caps. I still do. Whenever my wife is in a store without me and she spots them she buys a pack for me. They're fantastic, especially the root beer. They're not the CLOSEST kind of candy when comparing it with caramel creams. The closest would be none other than Payday. They both have caramel. In fact, out of all the picks, it's the only one with caramel. 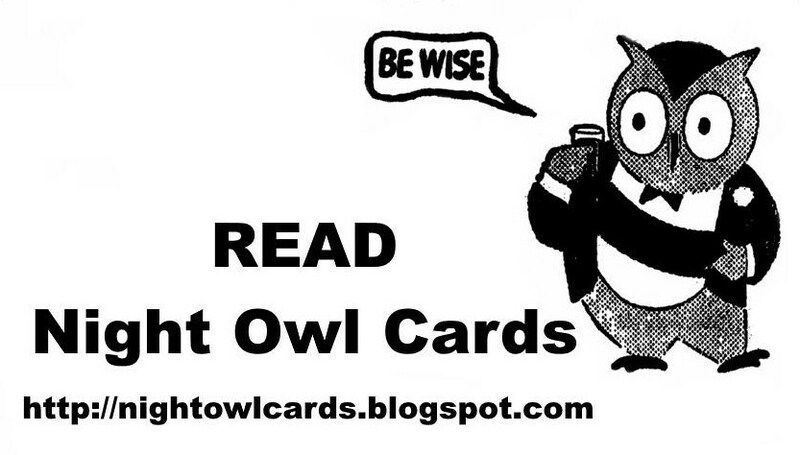 Andy, just email me your address (or leave a comment with your email address), and I'll send the cards off to you. 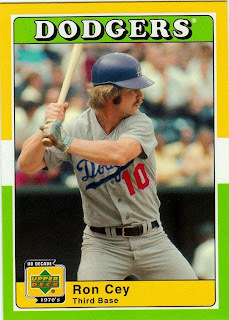 Also, if you have any particular favorite team or player or year you collect, let me know, and I'll send a few of those cards your way, too (if I've got 'em). I'm not the least bit sad that my prediction didn't hold up. After the Dodgers were eliminated, I was rooting for the Phillies to win the Series all the way. Yay, Plan B team! 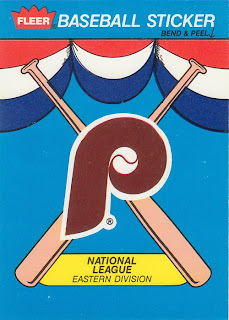 Congrats to Cliff at Capewood's Collections, and deal at Phungo, Chris at Stale Gum and Ross at Sports Card Info, and any other card blogger/Phillie fan that I may have forgotten. I'm happy for you all. The Phillies overcame whatever flaws they might've had and became champions. They're a likable group of players, too. I guess I'll add Michael Bourn to the list of players traded away in the year before their former team won the World Series. Sorry, Mike, but maybe Cliff's prediction will come true. In the meantime, no more baseball until March. Except around here, where it's baseball EVERY EVER-LIVING DAY. Like it or not. I just came home from work, but before I could get home I had to clean at least six inches of dense, heavy, wet snow off my car. If you live in the Northeast, snow is a way of life, but a bleeping N'oreaster in October is WAY too much WAY too soon. But it got me thinking about other "snow jobs." 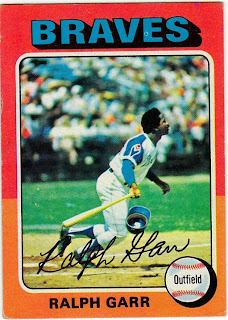 For example, my personal experience with the 1975 Topps Ralph Garr. 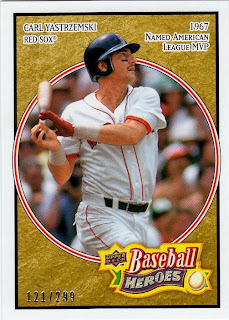 When I was a youngster, this was one of my all-time favorite cards. I first spotted it during my first trip to the Baseball Hall of Fame. For all of you readers, who when I mentioned the snowstorm, thought, "I'm glad I don't live THERE," here's another thing to think about: I've been to the Baseball Hall of Fame at least six times, probably more. That's one of the wonderful things about living in the Northeast. Cooperstown is right around the corner. And as my boss, who has lived in a variety of areas in the country, says, where we live, we can resolve most of our weather disasters with a shovel. OK, tangent over. There are three things I remember about first going to the Hall of Fame. (I was probably around 10 years old). The first thing I remember is my youngest brother getting car sick. The second thing I remember is spending time in a podunk laundromat while my parents cleaned my brother's clothes and being fascinated that you could purchase a can of spaghetti from a vending machine. 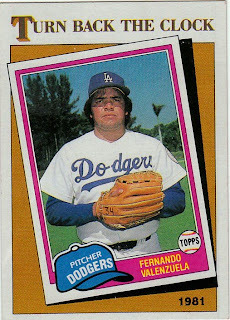 The third thing I remember is the huge display of every 1975 Topps baseball card at the Hall of Fame. Forget the bronze plaques. That's what I remember. And I especially remember the Garr card. I thought the photo on that card was as awesome an action shot as there ever was. The Roadrunner about ready to take off! And he don't need no stinking helmet. I wanted that card so badly that I sent away for it out of some collector magazine. And I enjoyed that card for years. Wait a minute! Isn't that exactly the same photo as the one in the 1975 Topps card? 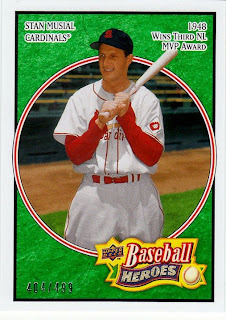 Now, I had been fully aware for years that Topps was known for repeating the same photo from year to year, especially in the 1960s. But when I saw this card, I felt tricked. Topps had snowed me! I compared the cards side by side, hoping that Topps had used at least a different frame. 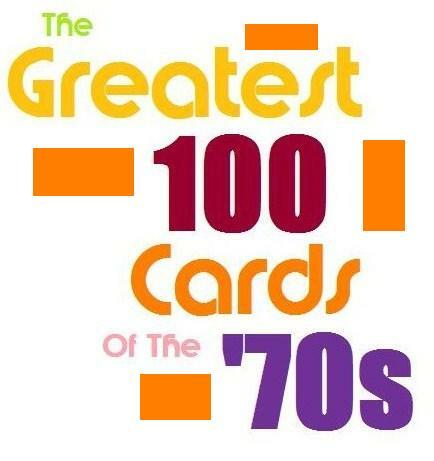 But the '75 card wasn't an original at all. Garr had played this scene once before! I know it's silly, but the 10-year-old in me couldn't help but feel a little hurt, like they had pulled a fast one on me. So there you go. Now that's a snow job. One that was about 30 years in the making. I'm about to get sappy. But it won't last long. Twenty-one years ago today, my wife and I started dating. She's been my sweet and beautiful girl ever since then. She's barely had an interest in baseball all these years, yet she's put up with my nonstop babbling about the sport and the piles of cards around the house without complaint. 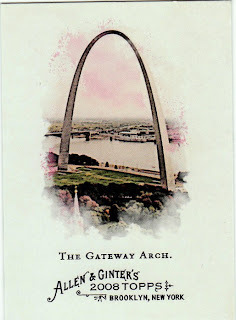 We actually began dating in St. Louis, of all places. I live far away from the Gateway to the West, but the two of us and a bunch of fellow budding college journalists took a road trip halfway across the country for a four-day seminar. We partied for those four days, spent Halloween on Laclede's Landing, toured the old Busch Stadium, drank in countless bars, danced on riverboats, went up to the top of the Gateway Arch, and made memories that will last forever. 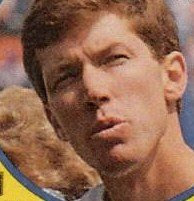 And in 2008, Allen and Ginter decided to make a card to commemorate Oct. 29, 1987. Thanks guys! I received my box o' surprise cards from Indians Baseball Cards. Always over the weekend, thanks to his wonderful Trick or Treat contest. As always, David went above and beyond with the goodies. Do you think when kids come to his house on Halloween he tells each kid, "Ah, take the whole bag." That's how generous he is! The catch to this contest is you might get some tricks with your treats, and David is an observant fellow. 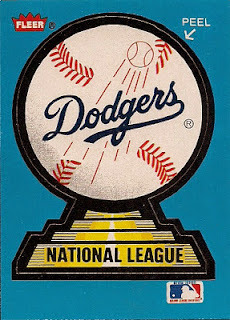 I was almost certain I'd get some San Francisco Giants mixed with my Dodgers or even some horsey cards. I even mentioned to my daughter that she might end up with a couple of my cards. Wasn't she disappointed when they all ended up being Dodgers! 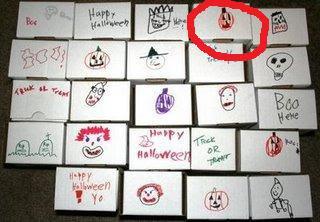 Like other card bloggers, I tried to guess which box was mine when I saw them all lined up on the Tribe Cards site. I guessed wrong. I'm not sure if it's a ghost or a skeleton. 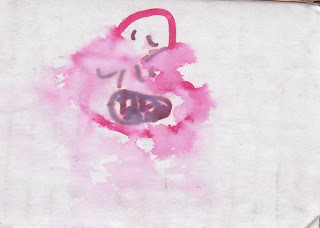 But I think the smears actually make it a bit more frightening! 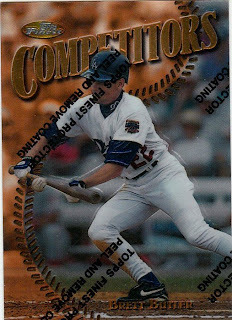 Brett Butler, 1997 Topps Finest Competitors. Yeah, I've already peeled and removed the coating. I'm an instructions follower. Hubie Brooks, 1990 Classic traded series. Man, I love these cards. As loud and garish as Zubaz pants. (No, I never wore any Zubaz. I like my cards loud, not my clothes). 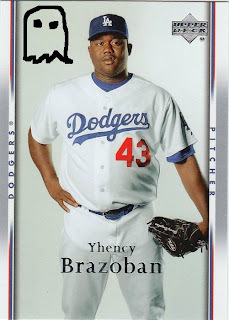 Look, Mr. MS Paint Ghost is visiting Yhency Brazoban, who has nicely tucked in his jersey top for this photograph. 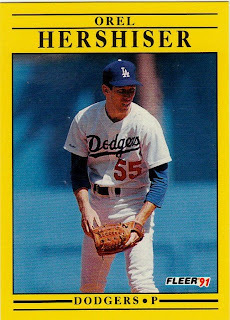 Orel Hershiser on one of those GD awful 1991 Fleers. I'm quite certain whoever came up with that design ended up in a padded room somewhere. No one in their right mind would design something like that. An odd choice of photo. 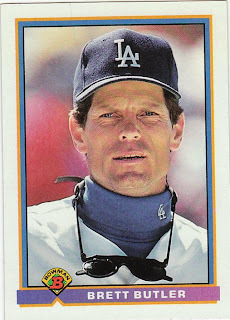 I wonder what Orel's thinking about. Perhaps the contest to win 15 packs of 1993 Upper Deck? Only one more day to enter! These Black Diamond cards rock. Much more than I can say for Mr. Charter-A-Jet-For-Me-And-I'll-Sign-With-You. This 1991 Bowman card is appropriate for Halloween because if you told me that this photo of Butler was not of Butler, but actually a wax figure likeness, I would've believed it. It's semi-creepy. 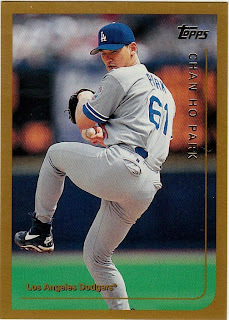 ... and the 1999 Topps Chan Ho Park, represent my first two Topps cards from both of these years. I'm telling you, I did not collect in the mid-to-late 1990s. 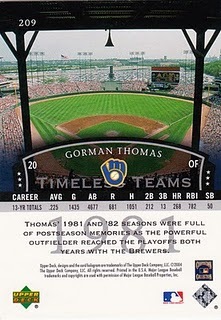 I still have no Topps from 1996 (and after looking at the design, I'm not sure I want any). 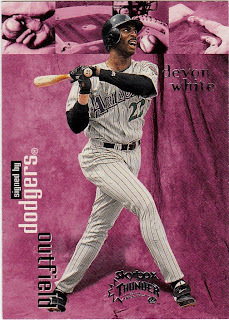 Speaking of '90s cards. This is a card from some company called Circa. Sorry, never heard of them. I'm sure there are loads of bloggers out there that can tell me all about Circa. Frankly, I don't know how any collectors got anything else done when collecting in the '90s. The amount of card brands then is staggering. It's been reined in quite a bit since then, but the variations are still a bit mind-boggling. Kuroda, 08 Topps (a&gm(a&gbk)). And I'm sure it can get a lot more complex than that. 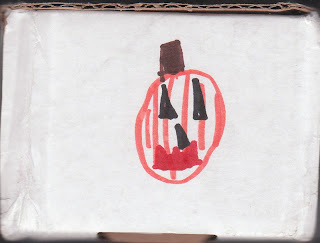 Hey, it's a visit from MS Paint Pumpkin! 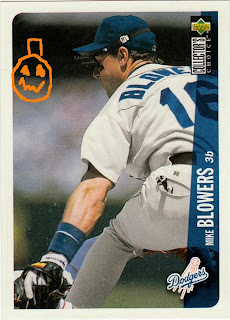 Blowers was another 1990s acquisition that backfired in the Dodgers' faces. This is one of the nicest shots of Dodger Stadium that you will see on a card. 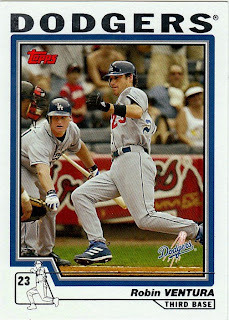 Very nice card of the man that came to L.A. in exchange for Paul Konerko. Excellent choice, Dodgers management. Wooooo. Spooky mirror card, by the radical SPx, which will NOT be defined by rectangular cardboard conventions. Unfortunately, I've already mucked up this card with my fingerprints. Devo! On his way to the Dodgers. You've got to love Skybox with the bizarre lavender front and the painful script on the back: "You still got the speed you need, so catchers better take heed. You got a feel for the steal, and you're takin' what's yours." Yikes! People who talk like that probably wear Zubaz pants. 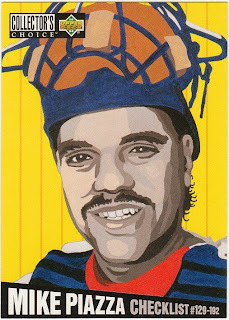 Tribe Cards is my Piazza supplier. My Piazza pusher. 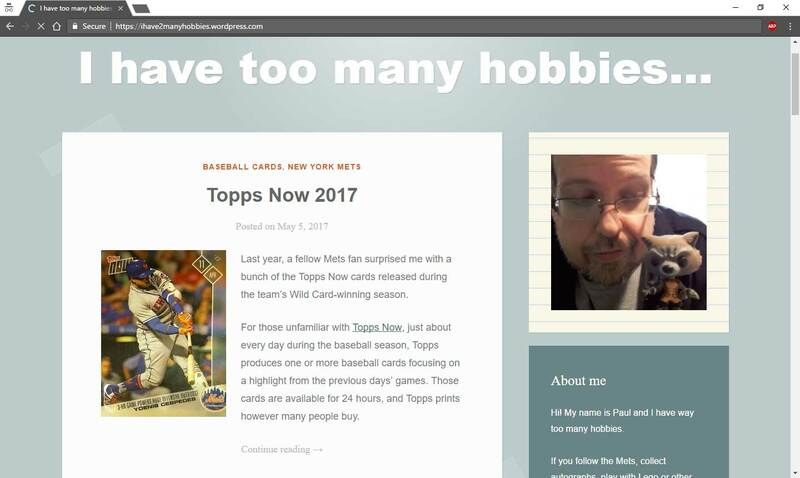 Before I started this blog, I had 10 Piazza cards. David has doubled that in a month. I'll end it with Fernando. 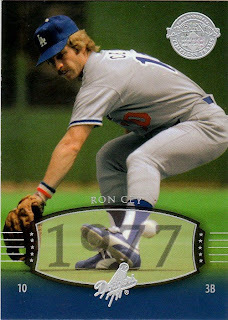 A Topps 1986 Turn Back the Clock card and interestingly one of the very few Topps Dodger cards from between 1971 and 1991 that I don't have. It's hard to find one that I'm missing, but David did it again! Thanks as always David. Getting this box made a Saturday full of rain and a difficult shift at the office much brighter. It was the day's highlight.